The Presonus AIR12 is simply one of the best speakers you can buy..
Each type of power amplifier has advantages and disadvantages. By employing different amplifier types for each driver, AIR12 loudspeakers use the respective strengths of Class D and Class A/B amplifiers to provide optimal response throughout the speaker’s frequency range. A 500W (continuous), Class D amplifier powers the 10-inch low-frequency driver, providing efficient, clean low end when you need it. A 200W (continuous), Class AB amplifier powers the 1.35-inch high-frequency driver, delivering a natural sounding, "AIR-y" high end. The combination can deliver up to 131 dB SPL of sweet, clear sound between 48 Hz and 20 kHz. The AIR12 loudspeaker is equipped with an easy-to-use signal processor that makes it simple to customize your loudspeakers with the push of a button. 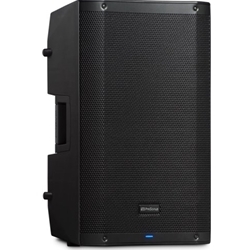 Presets customize the AIR12s response for use as front-of-house mains; as monitor wedges; for music playback (e.g., for DJs); for enhanced low end and a warmer sound; and for improved speech intelligibility. Treble and bass controls let you boost or cut by 10 dB to compensate for room anomalies. Location presets let you optimize performance for stand and bracket mounting as well as flown installations. The AIR12s molded plastic cabinet can be mounted in several ways, providing tremendous versatility. The multi-angle enclosure sports nonskid rubber feet on the bottom for upright front-of-house use and nonskid rubber feet on one side for stage monitor applications. Rig the speaker using M10 fly points, yoke-mount it to walls or beams, or ground-stack it for portable applications. Mount it on a tripod or atop an AIR-series subwoofer using an optional sub pole. The integrated dual-position pole mount lets you aim the speaker level or at a 7.5Â° downward tilt. And the AIR12 is easy to transport, thanks to its top-mounted handle. AIR-series full-range loudspeakers offer a choice of inputs so you can use them with a variety of sources. You get two combo XLR mic/TRS line inputs, each with a Class A microphone preamplifier and independent gain control. A stereo 1/8 connection admits signals from smartphones, tablets, and other consumer audio devices. These signals can be combined with the AIR12s internal mixer, and a balanced XLR Mix output lets you send pass the signals to other AIR-series loudspeakers. With their best of both worlds power-amp configuration, carefully programmed DSP presets, versatile mounting options, flexible inputs with onboard mixing, and other professional features, PreSonus AIR-series loudspeakers are an excellent choice for both mobile and installed sound. You'll love their easy transportability and their affordability. But the best thing about AIR-series loudspeakers is their clear, natural, AIR-y sound. Don't just take our word for it, though. Check out AIR-series loudspeakers at your favorite PreSonus dealer.